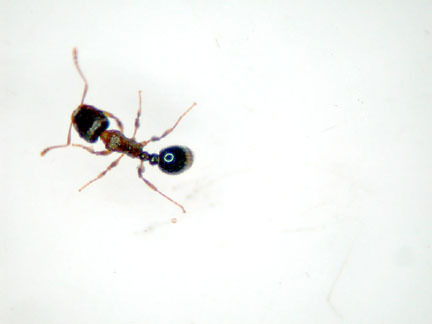 We’re constantly on the lookout for the newest, emerging Ant Pest Control Products and Services. Why not sign up here and be notified as when we’ve updated our offerings? You can use this handy form to the right. If you have a specific question about any of our Services or the products we use feel free to contact us, we’re here to help you stay bug free! We believe in informing the customer and allowing them to make an informed decision. This information is by no means exhaustive. If you have any ant questions that you don’t see covered here please feel free to use our handy form or give us a call. Carpenter Ants: Among the largest of all ants. Worker ants are usually 1/4 to 1/2 inch long, with large heads, shiny black bodies and no sting. They eat almost anything but cause most damage by tunneling in wood, both indoors and outdoors, to make smooth, “sculptured” nest cavities. Pavement Ants: Small blackish-brown ants. Workers 1/10 to 1/8 inch long with mild sting. Mostly nesting outdoors under stones or in cracks in paving, but often invading homes seeking food and sometimes nesting in crevices indoors in winter. 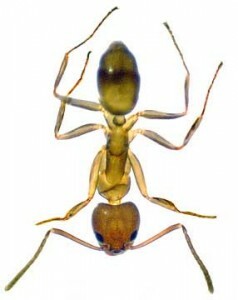 Pharaoh Ants: Very small yellow or reddish ants. Workers only 1/16 to 1/12 inch long with mild sting. Originated in tropics and mostly found nesting in warm 80-86F, humid crevices indoors, such as near radiators and sinks. Active throughout the year, eating and contaminating all foodstuffs and sometimes attacking invalids and newborn babies. Easily spread between buildings on groceries and laundry. Argentine Ants: Small brown ants. Workers 1/10 inch long, with no sting but a severe bite. Found throughout the South and California , and in some other states. Mostly nesting in the ground under boards, tree stumps, concrete walks, and leaf piles, but sometimes over winter or nesting indoors, especially in heating ducts. Eats almost anything but prefers sweet foods and frequently establishes trails to raid food sources in homes. Fire Ants: Small reddish ants with blackish abdomen. Workers 1/16 to 1/4 inch long with powerful stings. Found in the Southern states, Arizona and California . Some species form large nest mounds in open ground, while others nest under boards, rocks and plants, and sometimes under buildings, especially near fire hearths. They eat everything from cereals to meat, and attack domestic animals and people, especially invalids and babies. What Can You Do Against Ants? 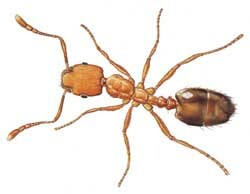 Many species of ants remain outdoors and are not pests. In fact, ants may be beneficial when they are predators on crop pests, and some are useful pollinators of plants. Ants can also improve soil quality because their tunneling activity enhances soil drainage and aeration and helps recycle soil nutrients. However, those ants which cause harm to people or property must be controlled using appropriate chemical and nonchemical methods. The choice of pesticide is especially important because some pesticides, particularly over-the-counter brands, are readily detected by ants and cause them to disperse and infest new locations. Also, many pesticides used by consumers perform poorly on soil and other porous surfaces, and are adversely affected by rainfall and ultraviolet light outdoors or by the heat and humidity in places where ants choose to nest indoors. Consequently, the selection and use of pesticides against harmful ants is usually best left to professionals. However, here are 10 nonchemical measures you can carry out that will discourage ants and complement other measures taken by professional pest control operators. Guard against importing ants by checking incoming materials for “hitchhiking” ants. Pharaoh ants can be carried in luggage, laundry and groceries, and Argentine ants may be introduced in balled nursery stock. Trim trees and bushes away from buildings to discourage ant passage. Remove plants that attract ants because of their fruit or nectar, or because they harbor honeydew-producing insects (e.g. fig trees, cherry laurel, bamboo, oleander). Eliminate tree stumps, leaf piles, boards on the ground and other favored nest sites outdoors. Seal cracks in walks and driveways and rot holes in trees where these provide harborage for ants. Store firewood off the ground away from building, and check it for pests before bringing it indoors. Screen windows and vents, and seal crevices in foundations and around doors, windows and vents to discourage ant entry. Correct outside moisture problems, such as leaking flashing, clogged gutters and downspouts and soil-wood contact. Ensure good ventilation in attics and eaves, and eliminate moisture problems caused by plumbing leaks or condensation in bathrooms and kitchens. Keep food and garbage in tightly fitting containers, especially overnight, when many ants are most active. There are an estimated 10,000 different species of ants worldwide. Some experts believe ants are more numerous than any other group of creatures on earth. Ants are related to wasps and bees and live in colonies or nests containing worker ants and one or more queen ants. Worker ants may live 7 years and queen ants up to 15 years. A colony of ants may survive more than 20 years. Ant colonies of some species may contain more than half a million ants. Many ants have powerful bites, but some species, especially fire ants and harvester ants, have poison stings which cause pain and sometimes disfigurement and death of people, pets and wildlife. Ants eat a wide range of foodstuffs and can cause food contamination in homes. Outdoors, crops and ornamentals can be damaged directly by ants or because ants may protect aphids from predators in return for honeydew. Some ants are small enough and persistent enough to get into almost anything searching for food. They are a particular hazard in hospitals where they penetrate sterile packs. Ants can spread disease organisms. One species, the Pharaoh ant, which invades homes, restaurants and hospitals can carry more than 20 types of bacteria, including several responsible for gastrointestinal and urinary infections. Carpenter ants can cause major structural damage in homes. Some species of ants also cause short circuits by chewing wiring, while others cause settling of roads and even runways by excavating soil. If you’re interested in the Ant Pest Control Service offered by Termite Terry please feel free to call us at 949-631-7348 in order to set up an appointment or use our online Order Form and we’ll get back to you as soon as possible.